Situated on a high outcropping of Black Hand sandstone, Cantwell Cliffs is in one of the most remote areas of Hocking Hills State Park, and offers hikers the best of two worlds. The high rim trails offer far-reaching vistas of breathtaking beauty, while the valley trail makes the visitor feel diminutive when walking at the base of the cliffs. Cedar Falls has the greatest volume of water of all the falls in Hocking County, with water plunging 50 feet. It’s easily the most photographed of waterfalls in Ohio. The name Cedar Falls is a misnomer — the result of mistaken identity. Early settlers to the area misidentified the stately hemlock trees as cedar trees; but the name Cedar Falls has been used ever since. A State Nature Preserve since 1977, Conkle’s Hollow’s sheer cliffs of Black Hand sandstone rise nearly 200 feet above the valley floor. The deep, cool gorge, which is only 100 feet wide in places and is considered by some to be the deepest in Ohio, has numerous waterfalls cascading over its sandstone cliffs. Towering cliffs, waterfalls, and deep gorges are all found in Hocking Hills State Park. 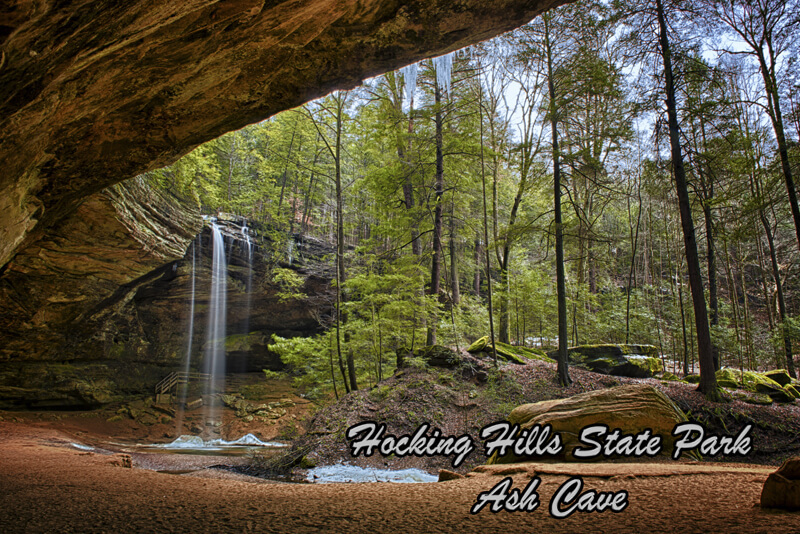 Actually encompassing six distinctly different natural areas, Hocking Hills State Park, Ohio offers such great diversity and such incredible outdoor options, that the Hocking Hills State Park area will call you back again and again. With each visit you will enjoy a new experience at this magnificent Ohio State Park, including: Ash Cave, Cantwell Cliffs, Cedar Falls, Lake Logan, Old Man’s Cave and Rock House. Old Man’s Cave is the most visited area in Hocking Hills State Park, featuring rock formations with names like the Devil’s Bathtub, Sphinx Head, Eagle Rock and Whale in the Wall. It was named for the rock shelter that was once the home of Richard Rowe, a 19th-century hermit who is said to be buried beneath a cave ledge on the premises. The only true cave in Hocking Hills State Park, this grand tunnel-like corridor is situated midway up a 150-foot cliff of Black Hand sandstone. The cavern features natural cut-outs which look like windows. Used by Native Americans for turpentine stills, by pioneers for animal shelter, and even by criminals for a hideout, Rock House has a colorful history. Rockbridge’s natural arch or bridge is more than 100 feet long and 10 to 20 feet wide, and gracefully arches 50 feet across a ravine. It is considered the largest natural bridge in Ohio. There’s a parking area and a 2.75 mile trail system to the natural rock bridge.